After the leaks here is the official announcement. If I got it right, they managed to make the SL3 even smaller than the previous models. The Canon Rebel SL3/EOS 250D/Kiss X10/EOS 200D Mark II can be pre-ordered (starting $549) at our exclusive affiliate partners B&H Photo and Adorama. Interesting fact: you get pre-order discount between $50 and $100. MELVILLE, N.Y., April 10, 2019 – Combining ease-of-use with high-image quality, Canon U.S.A., Inc., a leader in digital imaging solutions, today unveiled the EOS Rebel SL3 DSLR camera, the smallest and lightest product within the current EOS lineup. Weighing just 15.84 oz1, the EOS Rebel SL3 offers users a compact system delivering high-resolution images – complete with an APS-C imaging sensor, DIGIC 8 Image Processor and 3.0-inch vari-angle LCD touchscreen as well as 4K video, a first for the EOS Rebel lineup. Compatible with Canon’s full line of interchangeable EF and EF-S lenses, along with the ability to instantly send images to compatible smartphones through Auto Image Transfer via Wi-Fi®connectivity2, the EOS Rebel SL3 is the tool needed to empower aspiring photographers to capture gorgeous shots quickly and easily. The EOS Rebel SL3 features autofocus (AF) capabilities, delivering nine AF points across the optical viewfinder. This includes a new Spot AF which allows users to focus on a precise area within the subject. The EOS Rebel SL3 is the first DSLR in the Canon EOS line to feature Dual Pixel CMOS AF3 with Eye Detection AF in Live View shooting mode. With its optical viewfinder and Live View LCD monitor, photographers can enjoy two different ways of shooting and customize their experience based on the scene. The system is also the first Canon EOS SLR to incorporate a Smooth Skin setting, which can help render skin tones as well as Creative Assist – an interface by which users can check and seamlessly change shooting conditions in Live View4 – such as white balance or brightness – in real time. EDIT: The name in Japan appears to be Kiss X10 and the announcement is likely to happen within this week. We can expect the Canon Rebel SL3 to be announced soon. The Rebel SL3 is EOS 250D in Europe and Kiss X9 in Asia. Nokishita spotted wireless certification data that lists all upcoming Rebel SL3 kits. See image below. BCN rankings for March 2019 show once more that Canon is the undisputed market leaded in Japan (and in the rest of the world too). Canon occupies the top 4 positions with the Canon Rebel T7i (EOS 800D in EU, Kiss X9i in Japan), Rebel SL2 (EOS 200D in EU, Kiss X9 in Japan) and the top selling EOS M50 (Kiss M in Japan). Interesting to see that the Sony a6400 already made its splash and ranks pretty well. BCN is a Japanese sale statistics company giving a good view of the Japanese camera market. Nokishita identified a Canon camera leaked through wireless certification authorities. 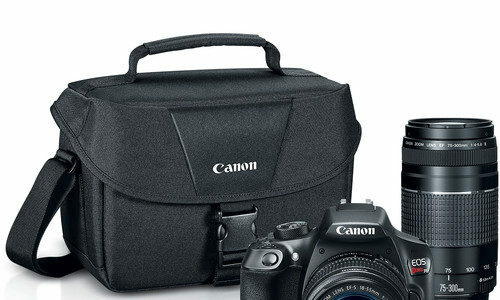 The moniker DS126761 refers most likely to the upcoming Canon Rebel SL3, replacement for the Rebel SL2. No hints for the announcement. Should happen relatively soon according to our information. The Rebel SL2 was announced June 2017. The Canon Direct Store has refurbished Canon Rebel T7i kits with the EF-S 18-55mm IS STM lens on sale at $599. Refurbished gear from the Canon Store comes with 1 year Canon USA warranty. Today’s Gold Box and one day only deals at Amazon US, Amazon DE, Amazon UK, B&H Photo, eBay, Adorama, and refurbished lenses and DSLRs at Canon Store. Save $10 on Luminar 2018 and/or Aurora HDR 2018 using our code “WATCH” at checkout. Get 10% discount on Capture One 11. All you have to do is to use the coupon code “AMBCW” when checking out from Phase One’s web store.